W I N T E R / S P R I N G 2 0 1 7 U O F L M A G A Z I N E | 1 9 H A P P E N I N G H E R E UofL working with Transportation Cabinet to analyze road conditions The Kentucky Transporta- tion Cabinet has a new, more effi cient method for evaluating the condition of 6,300 miles of highway and the University of Louisville is helping them do it. Lihui Bai, an associate professor of industrial engineering, has a state contract to merge and analyze old and new data from the cabinet's road inspections and help prioritize road repairs. The cabinet has recently begun using the Laser Crack Management System (LCMS). A laser mounted on the back of a state truck measures the cracks and depths of potholes on Kentucky interstates and parkways. The LCMS generates immediate, accurate, computerized data compared to the more subjective, hand-written reports state inspectors submitted when, until two years ago, they had to visually inspect roads. "There are a lot of gaps between the laser and visual evaluations, and we try to help them fi ll that gap," Bai says. Transportation offi cials say the work by Bai and her graduate research assistant is helping them be more objective and effi cient with tax dollars. "With this they're able to predict what the road condition is going to be next year or fi ve years from now, so they can allocate funds properly and make sure we're all driving on nice roads," Bai says. Construction begins on Belknap Academic Building Crawford Gym is gone. Soon it will be replaced with an $80 million, 170,000-square-foot academic building that will provide academic services and much-needed classroom space for undergraduate students. 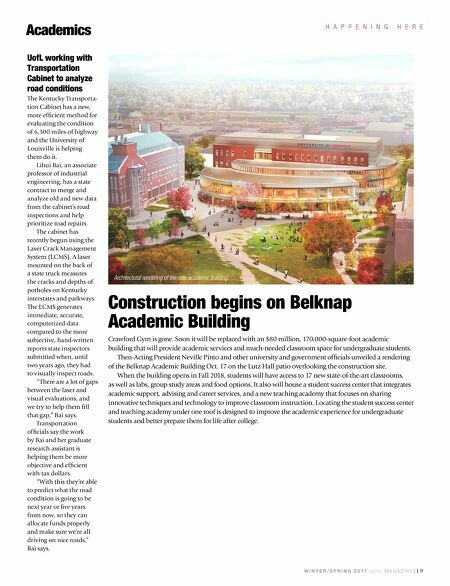 Then-Acting President Neville Pinto and other university and government offi cials unveiled a rendering of the Belknap Academic Building Oct. 17 on the Lutz Hall patio overlooking the construction site. When the building opens in Fall 2018, students will have access to 17 new state-of-the-art classrooms, as well as labs, group study areas and food options. 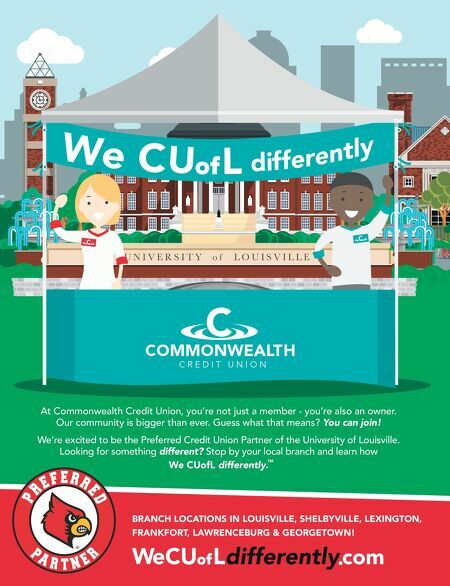 It also will house a student success center that integrates academic support, advising and career services, and a new teaching academy that focuses on sharing innovative techniques and technology to improve classroom instruction. Locating the student success center and teaching academy under one roof is designed to improve the academic experience for undergraduate students and better prepare them for life after college. Academics Architectural rendering of the new academic building.